Right then. 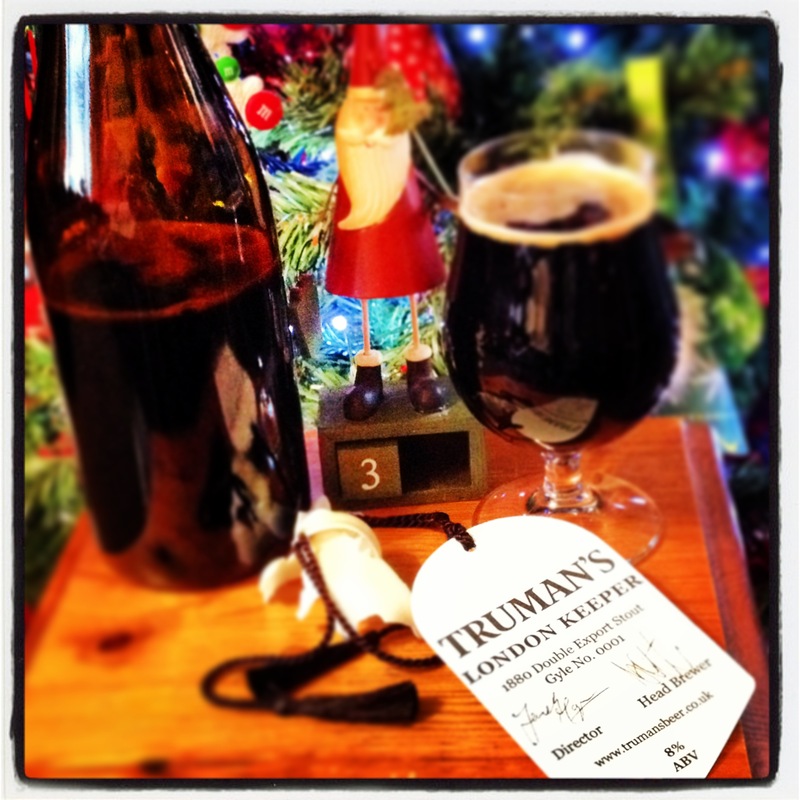 There have been a few reviews of Truman’s first beer from their new brewery circulating the blogging community since its release and most seem to say the same thing. I’m going to jump straight in and agree – it’s a great beer but it’s not ready yet. After cracking the wax seal (had to comment on that as never done it with a beer before) there is little initial aroma from the bottle. It pours really smoothly, with light carbonation and a small creamy white head. On the first taste it’s light, smooth with a hint of roasted coffee and then there’s a hint of black berries in there – where the hell did that come from?! This is one of the easiest stouts I’ve ever drunk. It’s in no way heavy going and really doesn’t taste like a stout – in fact as it’s warming it would be quite difficult to mistake this for a DIPA if you were blind tasting. As I’m closing in on the end of the bottle, I’m getting piney hops on the aroma and new flavours are emerging. This really has been a most enjoyable romp through the history books with Truman’s. Now to quantify my original statement , “it’s not ready yet”… All of the above flavours are there but are in no way washing over me. I think given a few years (I have a second bottle that I’m ageing) this will be an even more stunning beer than it is now. It’s polar opposites to the beers reviewed so far, being a fresh, light, golden ale. A tangy nose is followed by a smooth creamy ale, with a surprisingly zingy aftertaste that I’m putting down to the Belgian hops advertised on the pump crown. Very more-ish, but probably better suited to a warm summer’s day! I have been keeping my eye on this one for a little while. Finally got a chance to pick it up and I am glad I did. the appearance is cloudy dark mahogany in color with a fat tan head. the head faded slowly into a 1/4″ head with beautiful lacing on the glass. The smell is wild! fruity… cherries… but not your average cherries. deep & rich cherry tones & a sweet bread like spicy yeast smell. Taste is moderately sweet. Caramel malts, brown sugar, lighter molasses notes. Moderate fruity quality, mostly cherry, but there are notes of raisin, prune, and tamarind in the mix as well. Finish is fairly quick, a little watery even, leaving a faint raisiny port wash in the mouth. Overall a great sipping brew to really enjoy. I kinda wish I had a fireplace to sit by, a wedge of cherry/chocolate cake, and a smoking jacket! this brew makes me feel more important than I am! Like a good ale it greatly improves as it warms. great job on a very complex drink!! A trip to Red Willow in Macclesfield rendered my writing skills useless yesterday. Again another beer I’d been looking forward to getting stuck in to. A beer made with Italian truffles? Could be different. Having had the opportunity to sample a meal in Italy last year with about €200 worth of truffle shavings whacked on over the course of about 6 courses I was wanting to remember those tastes. Once again I ended up with a good slug of beer disappearing down the sink as it fairly fizzed out of the bottle. A bit of a pisser when you’re paying £4.70 or so for a 330ml bottle. You don’t want to waste too much at that price. First thoughts were that the beer just tasted odd. Wasn’t sure what the taste was and certainly no real hint that it had been made with truffles (from what I remember). Smell was really boozy, not what I was expecting, although at 8% I suppose I should have expected some alcohol to hit my nose. Even as I made my way through this beer the over riding taste was a big hit of boozyness. Apart from that it was all a bit of a mish mash and a disappointment really. Having just seen @NateDawg27’s review (caramel coated banana) the only thing I can say is that he has a much more refined palette than I do. Definitely in position 3 after day 3 for me. Really didn’t know what to expect with this beer. It’s a raspberry beer which comes in a paper wrapped bottle (why does that make it seem more special?!). Opened to a warm fruity aroma, very much raspberry led. The best thing about this beer is that it’s so well balanced. Often fruit beers are too sweet for me but this gets that balance spot on. A light slight head and a very light mouthfeel. I really like this beer. It’s fresh and light and crisp and very quaffable.